I had sent an email earlier about the difference between Luhansk and Luhanske. Sorry for the confusion, but the place where I was today was Luhanske, not Luhansk as it says in the dateline right now. Burned-out trucks — some still smoking — lined the cratered highway from Artemivsk to Debaltseve, which remains in contention. Government soldiers who were trying to tow a damaged ambulance out of the partly ruined town of Luhanske admitted that anyone who went further down the highway toward Debaltseve would come under heavy fire from rebel small arms and artillery. Two people were also killed and six wounded when a shell hit a packed cafe in the Kiev-controlled town of Shchastya near rebel-held Luhansk, a local official said, adding that other shells had struck elsewhere in the town. Saturday afternoon, right on deadline. The level of noise is increasing, the shouted instructions are coming faster and the production editor is handing round the international front page for a rapid press-read. The same stringer has filed a late update on the fighting from nearby Artemivsk, and it’s been hustled through the editing process and onto the page. Yesterday a military ambulance delivered the body of a soldier killed in the village of Paschnya, which is in the no-man’s-land between Luhansk and Debaltseve, to the mortuary in Artemivsk. Hang on. Luhansk. Is that … does he mean Luhansk? If he means the city, it’s miles away. Can there really be a no-man’s-land stretching 95 kilometres into another oblast? Another hasty skim through the article, and there’s no sign of any reportage or sourcing from that far east: all the quotes and accounts come from forces and officials around Debaltseve. A quick check on Google Maps reveals that, yes, Debaltseve, Luhanske and Artemivsk are all close, linked by the E40 road; on the other hand, there’s absolutely no sign of a village called Paschnya anywhere. 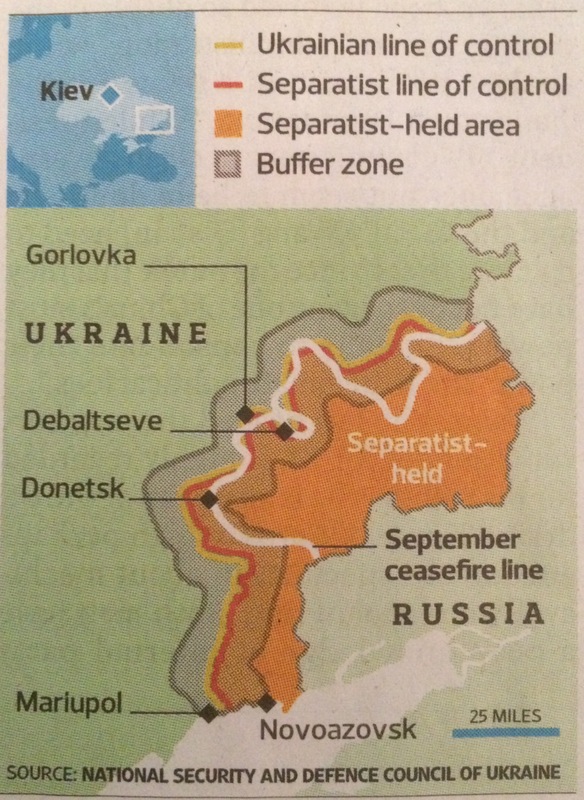 And the distraction is increased by the locator map on the page, right next to the paragraph in question: Debaltseve is marked, Donetsk is marked, and so is Luhansk, off to the east; but there’s no sign of Luhanske or Artemivsk. But then a check through the stored revisions of the article reveal that, inadvertently, the ‘e’ was indeed deleted off “Luhanske” at an earlier stage. The problem with journalism, or at least with newspapers, is that there’s never enough time to sort everything out properly. The fast read, panic over Luhansk, Googling and hasty conferring with a colleague has taken about two minutes. The best thing to do would be to reinstate the “e” in Luhanske, add a few lines to explain away confusion, recut the article to fit, and redraw the map at a slightly larger scale so that the town can be added to it (at its current scale, the blob for Luhanske would be right on top of the blob for Debaltseve). But there isn’t time for that. All there’s time for is to reinstate the “e”, and, as a prophylactic against possible confusion, hurry over to the graphics desk and ask them to delete Luhansk, the city, off the map altogether, and reoutput it. There’s just enough time for it to auto-update on the page before it’s sent: at least it won’t look like a typo or lead readers astray. And then it was gone: the page was sent and ran like that for the first three editions. Looking back at it now, the single reference to Luhanske is a bit baffling without explanation, and, on the map, I see I completely overlooked that we’d referred to a nearby city as Horlivka in the text (which is correct Tribune style) and Gorlovka on the map (which is not). But the stringer refiled after midnight, with a new top that explained clearly where Luhanske was: new quotes, new facts, rewritten all the way through. As the story acquired momentum through the night and into the next morning, the online version, updated regularly, was shared more than 500 times and drew more than 3,000 comments. The problems of the initial version were completely swept away. It was just a first take; just a holding story for the early edition, before the ceasefire agreement took hold and the story really began. Some articles take a lot of effort and then only last for five hours. But you never know which ones will last and which ones will end up on the spike. And if anyone finds Paschnya on the map, I’d be interested to know.